You are here: Home / ACL Recovery / Knee Injury / Brace yourself! I started training for the Essex Open last week, thinking that my knee was much further along recovering from an MCL injury sustained in December. In addition to the piece of soap my partner stashed in one of the grapes included in the salad I’d made for lunch, I had a nasty April Fool’s when I did the first sparring from stand-up I’d attempted since my injury. Missed a move and ended up landing bit funny on the injured leg and twisted it quite badly. Started an ibuprofen course to get the swelling down and I also invested in a new and heavier duty knee brace. 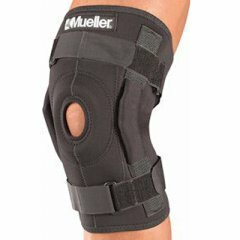 After some online research into the best knee braces for MCL injuries I settled on the Mueller hinged knee brace. Hinged knee braces are supposed to provide the extra support against lateral movement, which is where I’m weakest, but these babies aren’t cheap and the Mueller was one of the more modestly priced and had decent online reviews. I ordered my brace from online UK retailer Vivomed, as they promised next day delivery and I was pretty keen to see how I fared in takedown practice with a properly strapped knee. Alas, it hadn’t arrived after 5 working days, so I gave them a ring. They were very helpful and suggested that it might be stuck in the postal system somewhere and I should contact my local sorting office and get back to them when I knew more. After an eternity on hold and responding the automaton Sarah with key presses, I spoke with a Royal Mail rep to discover that I needed to wait until the 22nd to claim for compensation (as the brace was sent first class and so had no tracking attached to it). I rang back Vivomed, but before I could even ask that I order a new one and return the missing one if it showed up, they offered to resend the item if I agreed to return the previously posted brace if it did show up. Wow! Fantastic customer service; true to their word I received the brace today and will be fully strapped at training tonight. Would recommend these folks to anyone needing physio equipment. Rock on and roll on.